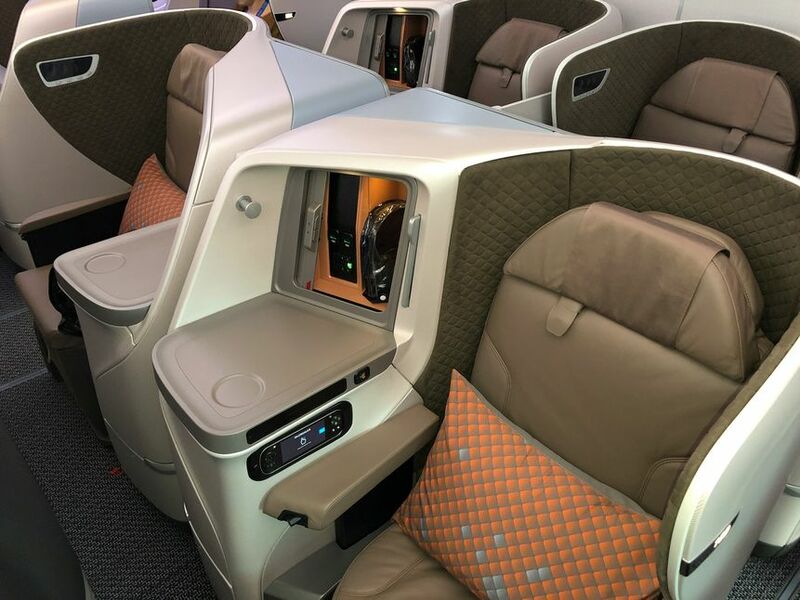 Singapore Airlines aims to revolutionise regional business class with direct aisle access flatbed seats being rolled out on across its Boeing 787-10 fleet and some Airbus A350 jets, but it could prove a tight fit for many passengers. 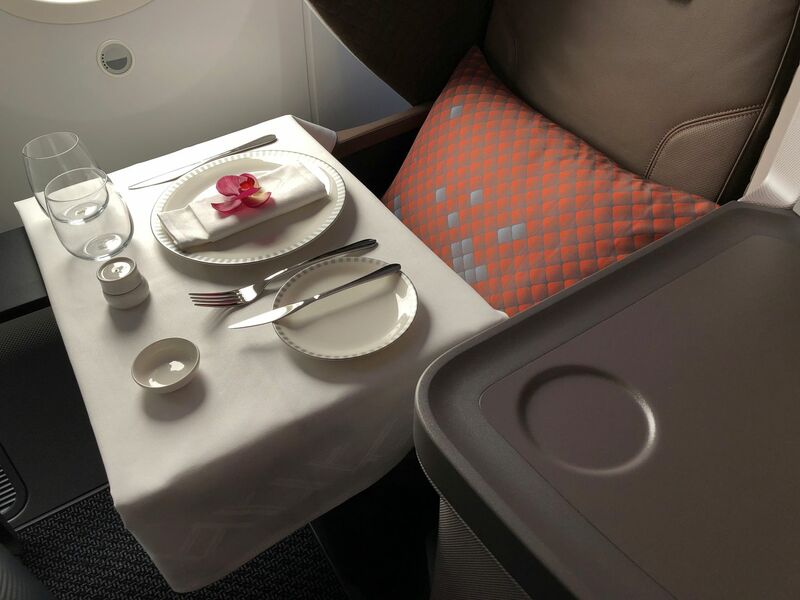 Singapore Airlines’ regional business class play is magic trick worthy of Houdini. Gone is the 2-2-2 layout and ‘sloping sleeper’ of SQ’s older jets such as the Airbus A330, for example. All that stale, worn last-gen oldness vanishes in a puff of smoke. …and a seat that converts into a fully-flat bed. Australian Business Traveller took a pew on the delivery flight of Singapore Airlines’ first Boeing 787-10 – a 23 hour journey from Boeing’s Dreamliner factory at South Carolina to Singapore, via Osaka for a fuel stop – to bring you this detailed review. 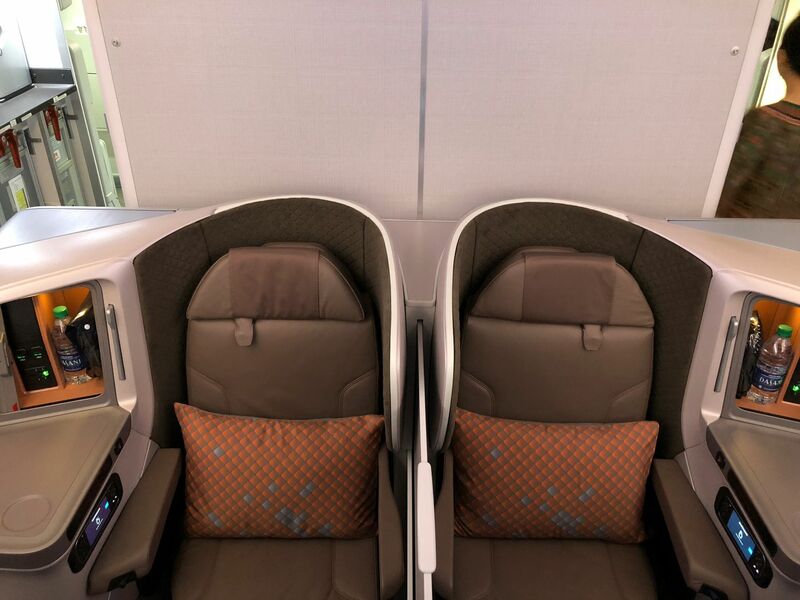 Singapore Airlines’ 2018 regional business class seat was created by the airline in conjunction with Stelia Aerospace, using Stelia’s Solstys III platform as a starting point but evolving into an all-new design which Stelia calls the Symphony. 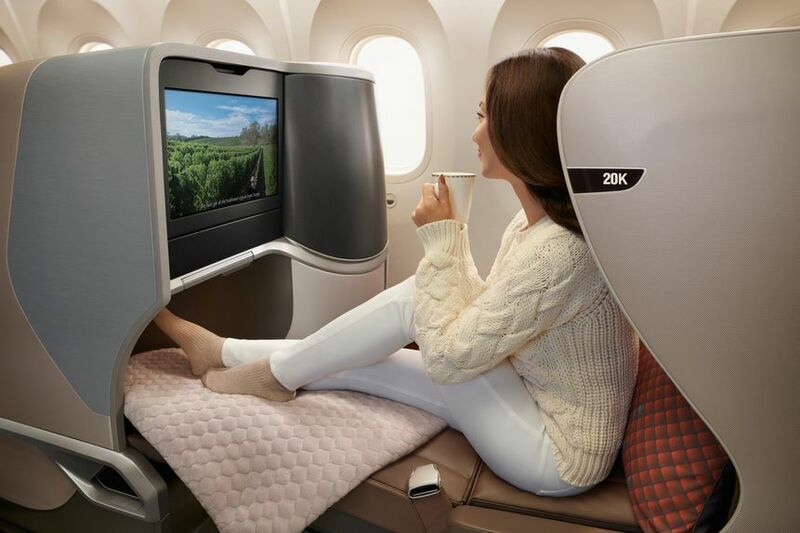 The seat adopts a staggered forward-facing arrangement, with all 36 business class seats in the Boeing 787-10 ranked in two alternating row layouts. 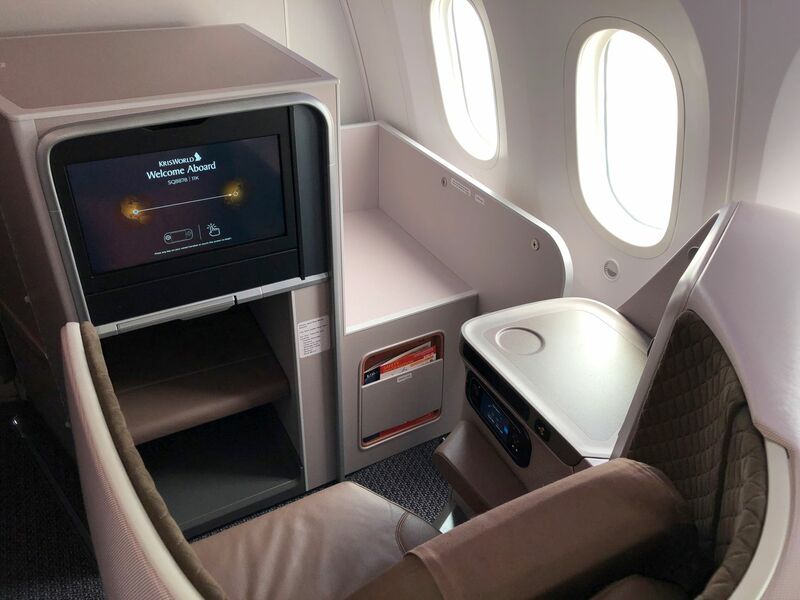 One row layout sees the passengers in seats A and K located directly next to the window, with a wide shelf between them and the aisle. 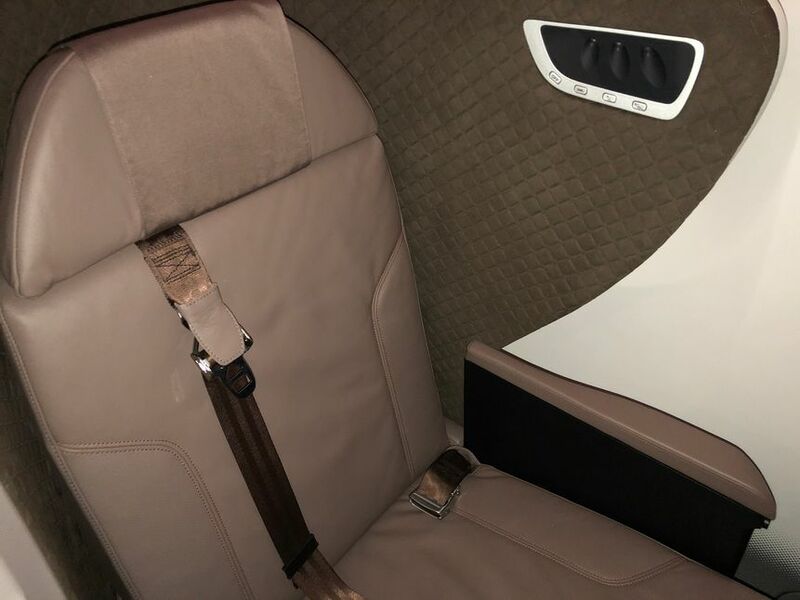 This is obviously the pick if you really want that window view, but be wary if you’re a ‘passenger of size’ – the narrow gap between the seat in front of you and the shelf next to your seat is a tight 23cm (9 inches). Almost any average-sized person will find this makes for a squeeze as you do a sideways stomach-sucked-in crab-walk from your seat to the aisle or vice versa. In this same row, the middle seats (D and F) are next to one another, with each seat’s console between the passenger and the aisle – making for the same narrow passage as mentioned above. 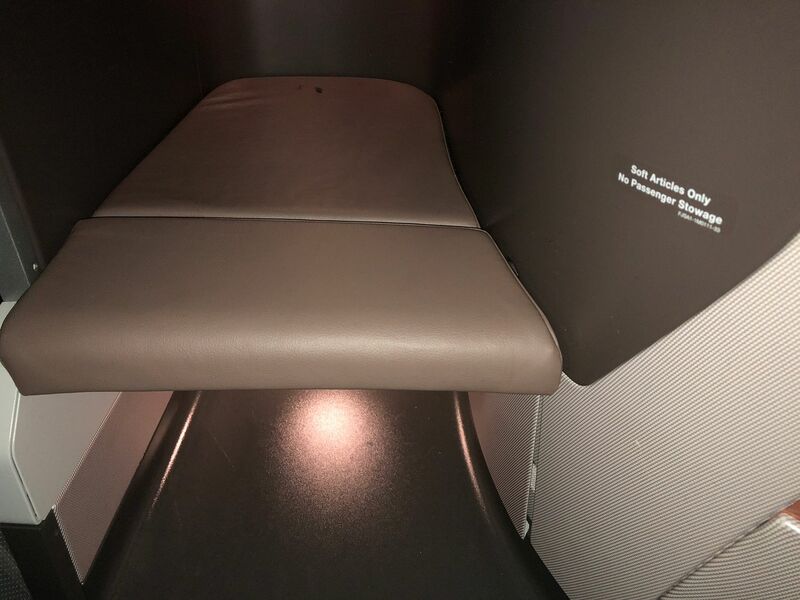 A pneumatic divider panel between these paired middle seats offers privacy if you’re flying solo and not in the mood to be social. … so converting both seats into beds means you’re sleeping next to one another rather than with one another. The second row layout – which alternates with the first – swaps things around. 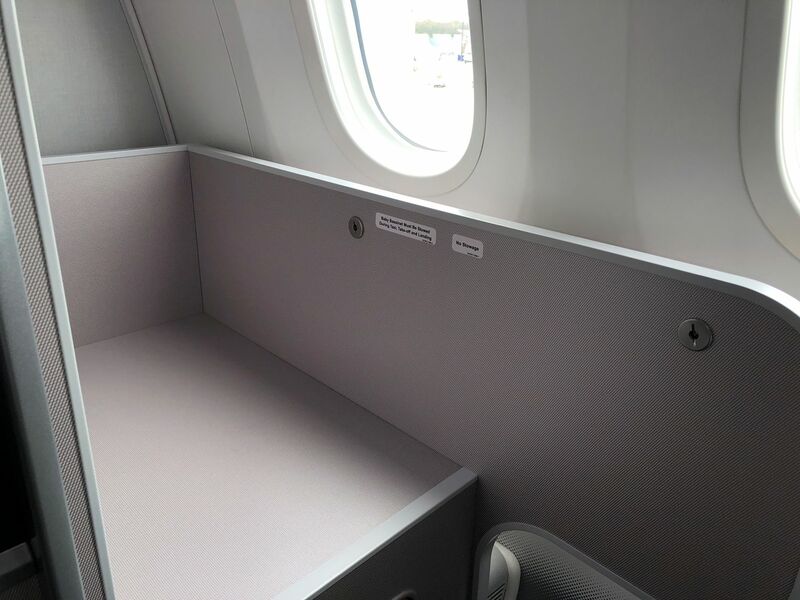 The ‘window’ passenger is now seated at the aisle, with the shelf between them and the window. Less ideal if you like a view, but far better for accessibility. 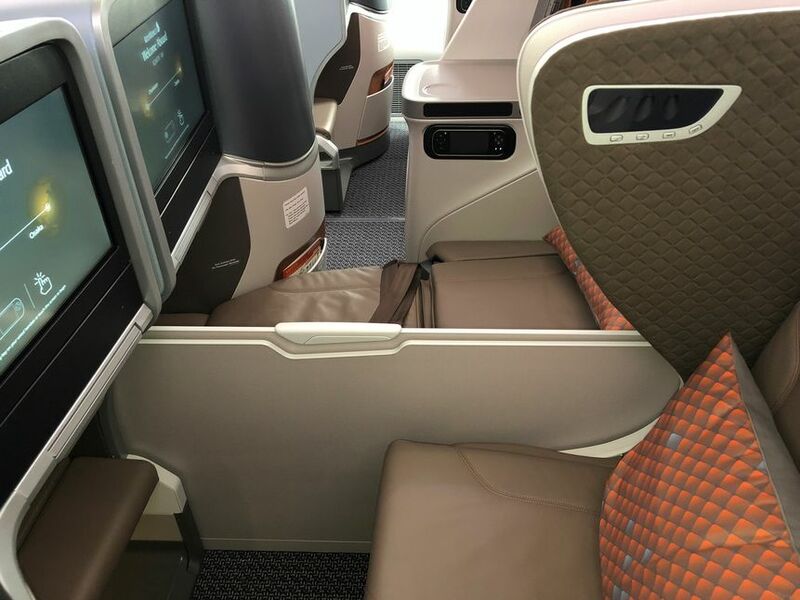 The middle seats are also at the aisles, with each seat’s console keeping the passengers well apart – so much so that those seats lack a divider between them. 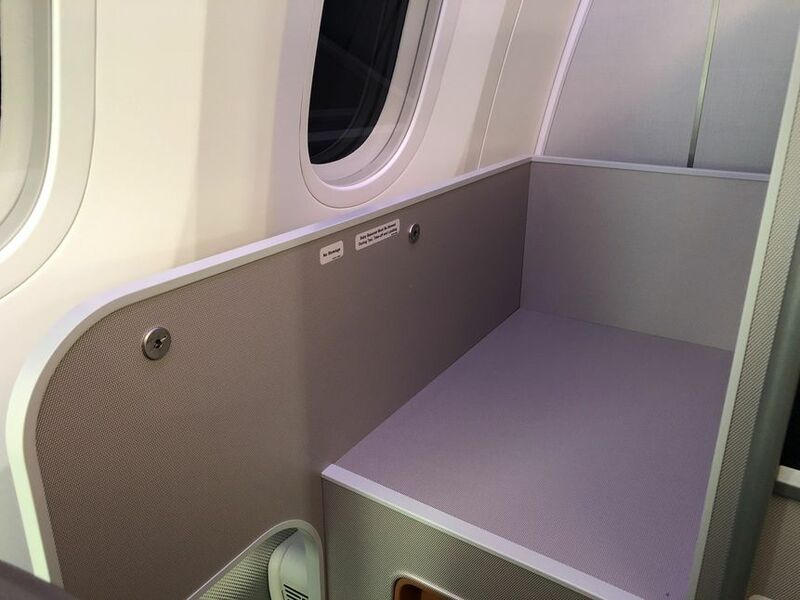 Passengers sitting directly at the aisle will find the curved seat shell adds a degree of privacy. 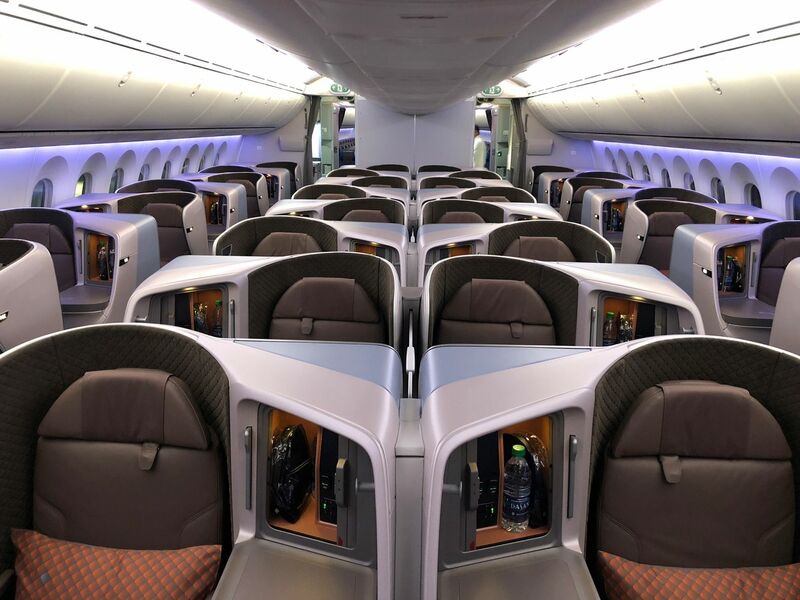 My pick would be row 11, the very first row of the business class cabin. 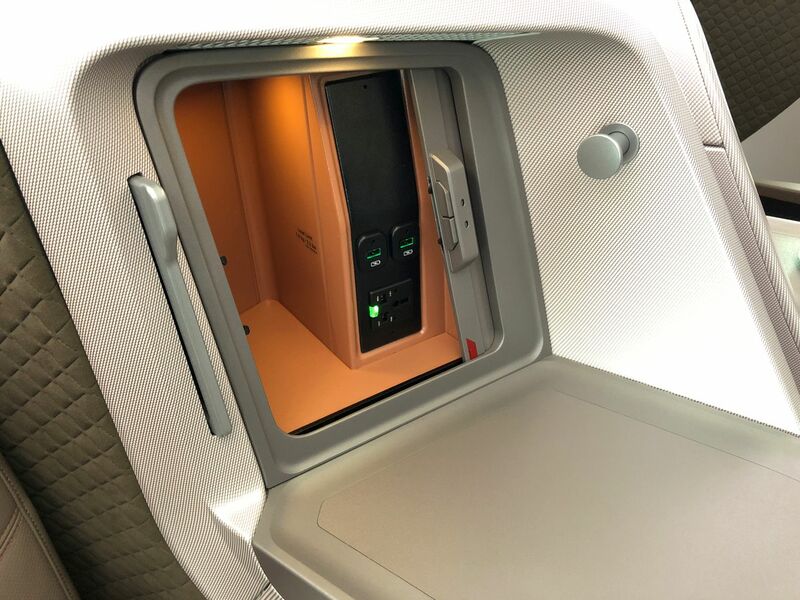 The window seats (11A and 11K) are closest to the aisle, making it easy to get in and out of the seat – plus they have a unique bassinet position which sees the kidlet-capsule set into a very large recess just ahead of each seat. 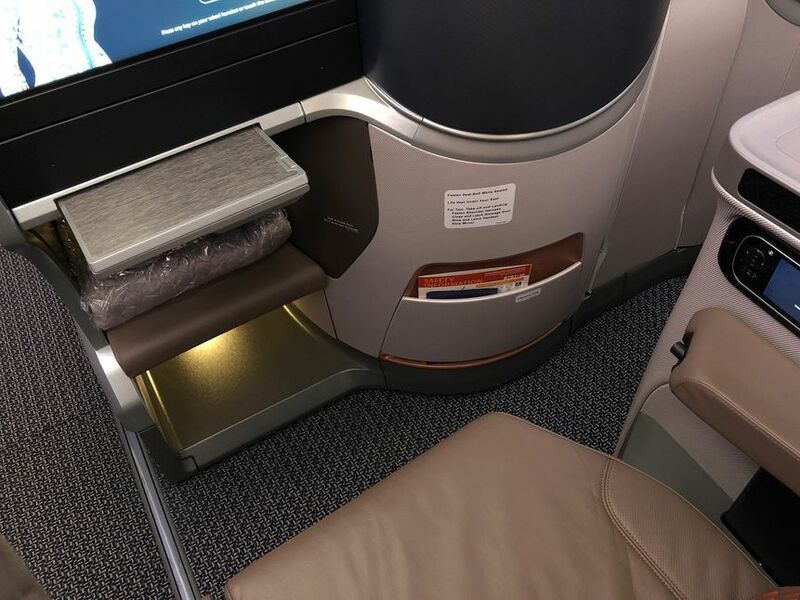 But if a bassinet isn’t in place (or if you book this seat before a parent does) you'll have a great area for keeping a bag within reach during most of the flight, rather than stowing it away in the overhead bin. 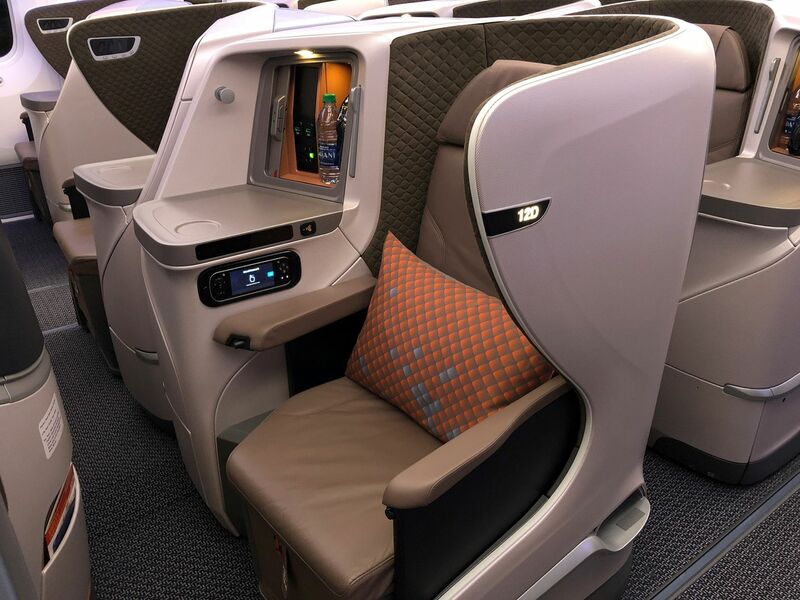 So if you want a ‘corner office’ in SQ’s new regional business class, shoot for 11A or 11K. And while the middle seats (11D and 11F) are close together in ‘honeymoon’ mode, which may deter solo flyers, there’s much more room (around 38cm, or 15 inches) for getting past the side shelf into the aisle. 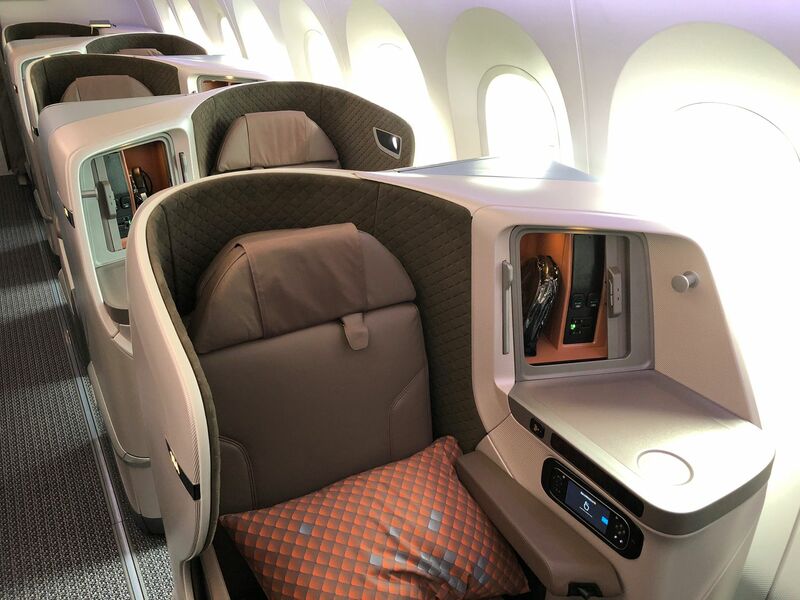 Also note that Singapore Airlines hasn’t installed an overhead crew rest in the Boeing 787-10 due to the relatively short flying range, so the centre bins above row 11 remain available for you to use. If you’re trying to work out which seats have which orientation, here’s the cheat sheet. Window seats with the passenger seated next to the aisle: 11A and 11K, 14A and 14K, 16A and 16K, 18A and 18K, 20A and 20K. Window seats with the passenger seated next to the window: 12A and 12K, 15A and 15K, 17A and 17K, 19A and 19K. 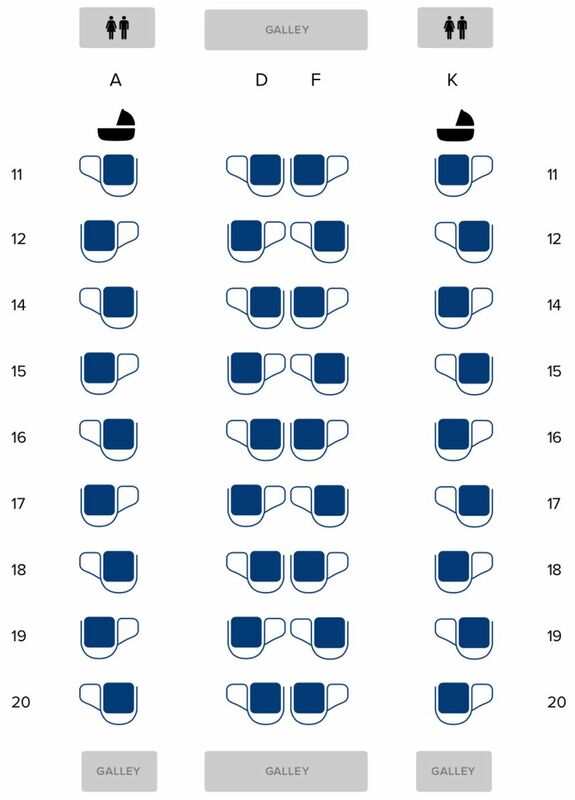 Middle seats with passengers seated next to one another and away from the aisle (aka ‘honeymoon’ seats): 11D and 11F, 14D and 14F, 16D and 16F, 18D and 18F, 20D and 20F. Middle seats with passengers seated away from one another and next to the aisle: 12D and 12F, 15D and 15F, 17D and 17F, 19D and 19F. Be warned: seats 16A and 16K have no window, only a blank slab of fuselage. Moving onto the seat itself presents another area where the squeeze factor kicks in. Each seat is just a nominal 20 inches wide. That’s what an optimist would describe as a snug fit, and it’s noticeably so unless you have a very slim build. 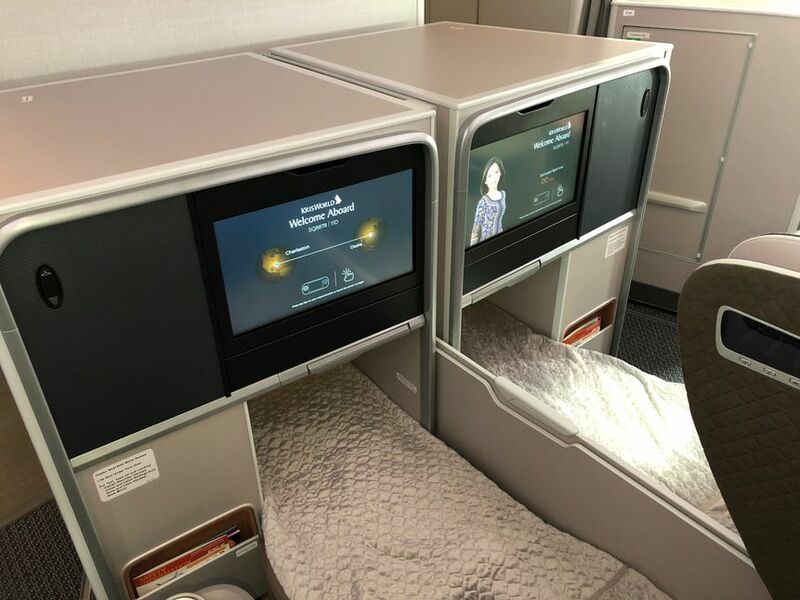 By comparison, SQ’s own premium economy seats average around 19 inches wide, while its conventional business class seats (on the Airbus A350, A380 and Boeing 777) range from 25 to 30 inches. 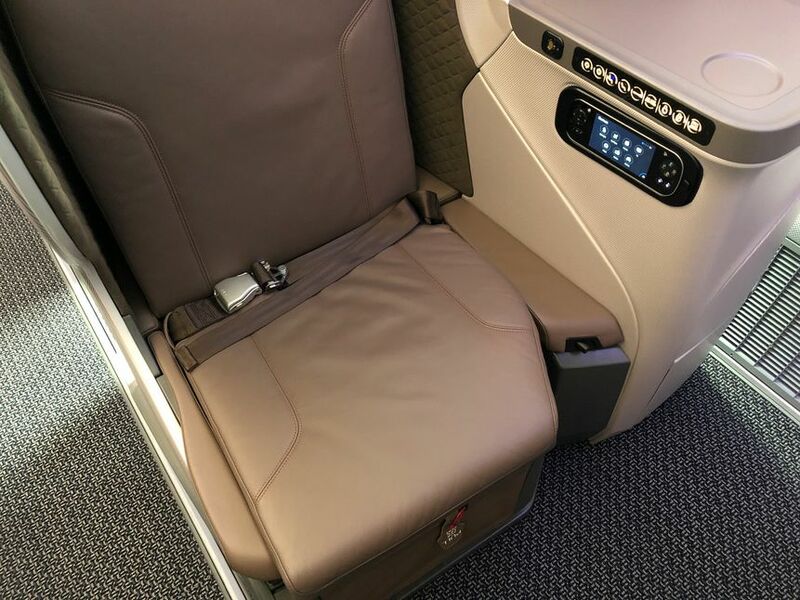 Fortunately you can lower the armrests on both sides to gain around six inches, bringing the edge-to-edge width up to a more comfortable 26 inches. But the squeeze is real. Sitting in a window-side seat with the armrest raised, my elbow closest to the window was almost jammed between the narrow edge of the armrest and the curved seat shell. 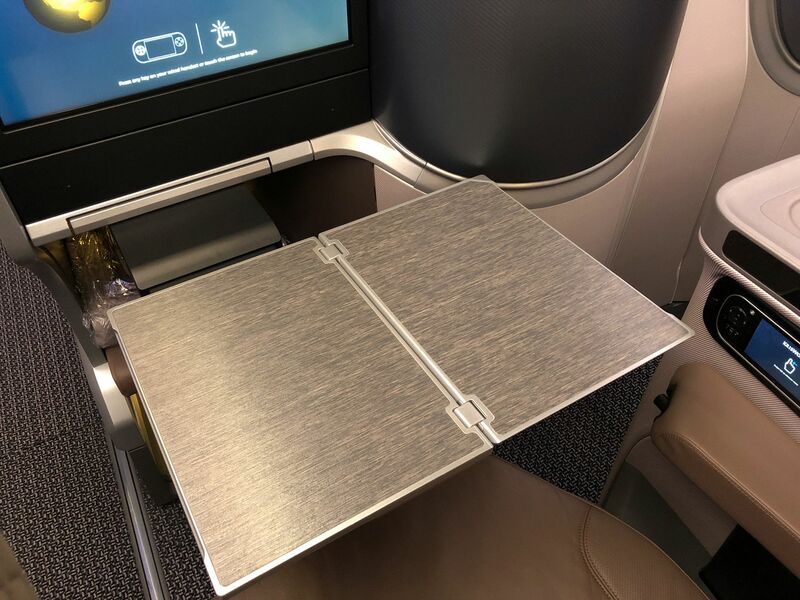 Lowering the armrest provided a little extra wiggle room but even then, when typing on my laptop my elbow was constantly brushing the padded sidewall unless I deliberately moved off-centre to the right side of the seat, at which point my right elbow was nudging the console. When watching a movie on the seatback video screen the most comfortable position was to cross my arms. 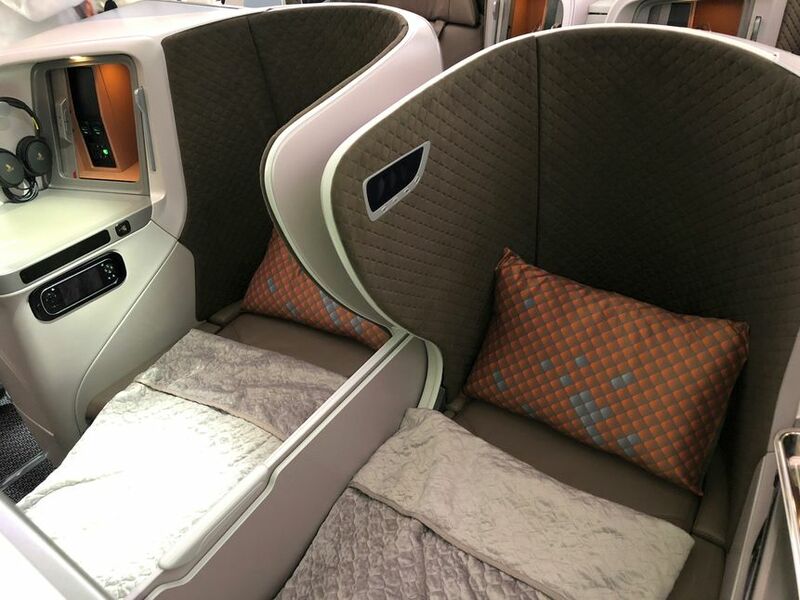 That’s far from ideal for a business class seat in which you could spend as many as eight hours, although of course that is the outer limit of this regional seat’s intended range – passengers on shorter hops around Asia may be more forgiving. All the same, it’s hard to avoid the impression that these seats are a bit too narrow. But if they’re narrow, they’re also long: the seats fold down to a fully-flat bed that’s 1.9 metres (76 inches) from head to heels. 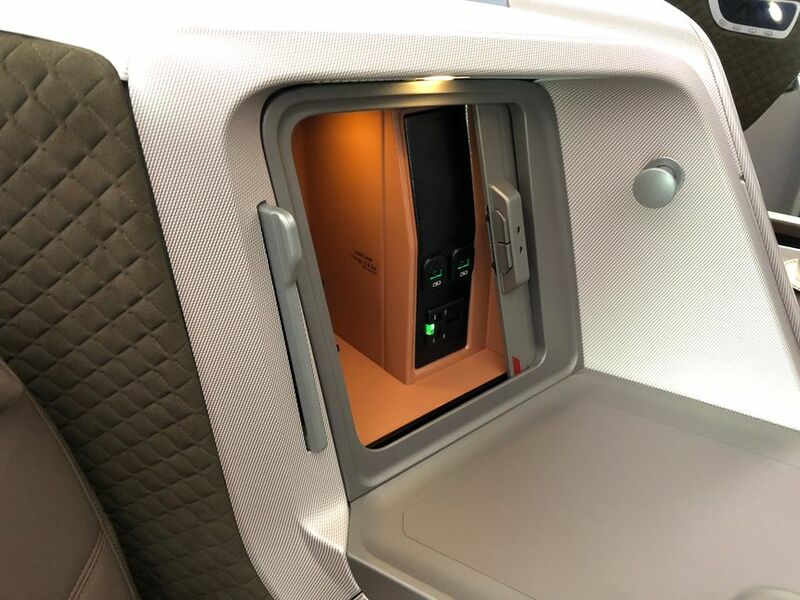 … and again, row 11 is the pick because of its location up against the bulkhead (rather than dovetailing into and under the seat in front) allows for a super-sized cubby for plus-sized plods. 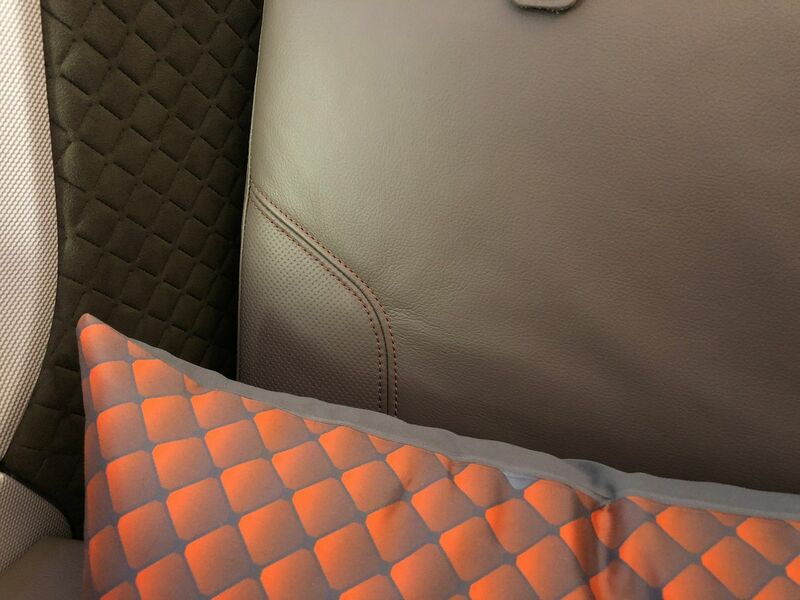 The inner shell of the seat is covered in soft Alcantara padding with a quilted pattern. 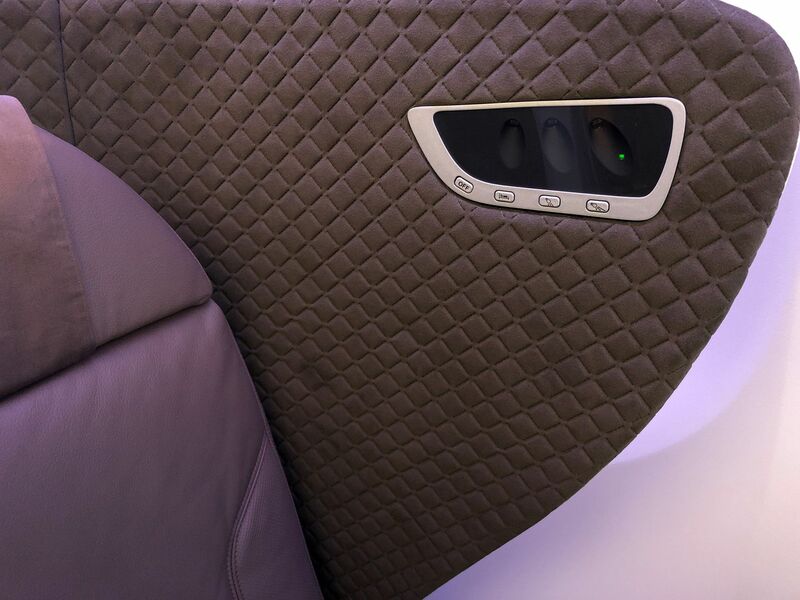 This not only provides a cushioning surface to rest your head against, it absorbs sound to reduce the overall levels of cabin noise. The entire surface of the top of the bed is usable, and the cocoon-like surrounding makes this a great little nest if you need to snooze. 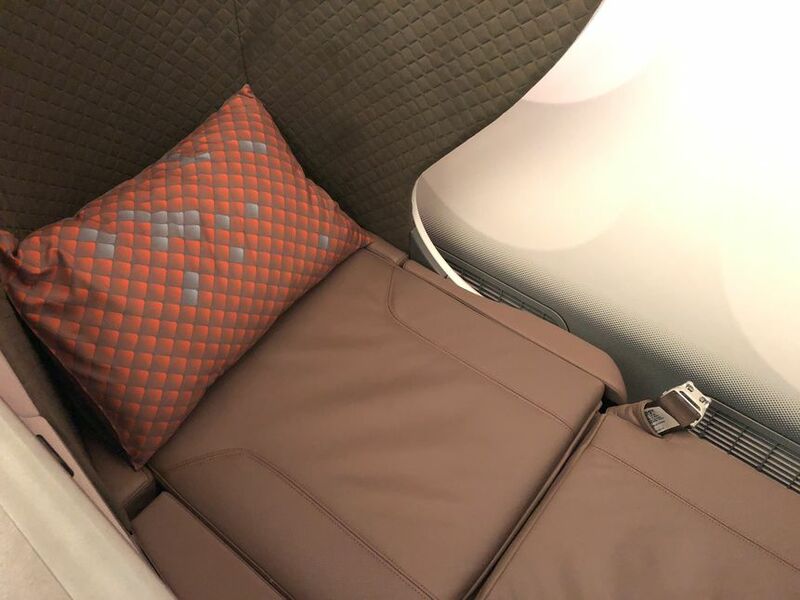 However, several passengers on the Boeing 787-10 delivery flight commented to me that the break line in the middle of the bed – where the seat back and base come together – created a noticeable bump which was best remedied by laying the airline-supplied blanket on top of the seat as a makeshift mattress. 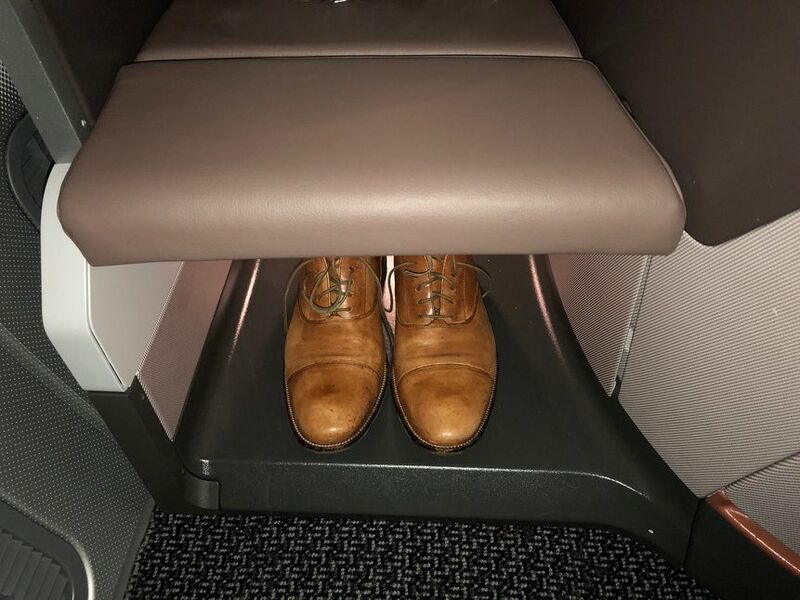 A recess beneath the foot cubby area is the ideal place to stow your shoes or a small piece of cabin baggage (such as slim backpacks, laptop cases and handbags). 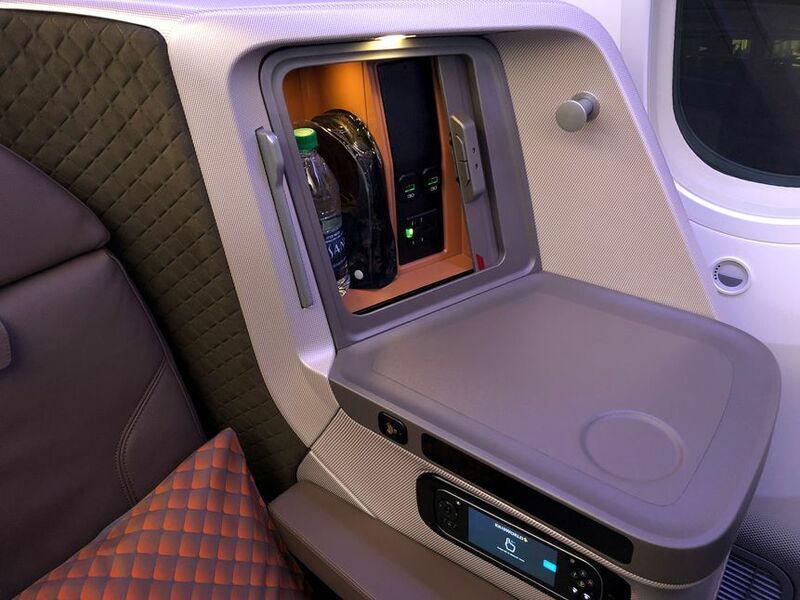 Also of note: the new business class seat uses a three-point harness for take-off and landing. When that extra strap isn’t in use it retracts into the seat and hides itself away under a small tongue so you’d never notice it’s there. 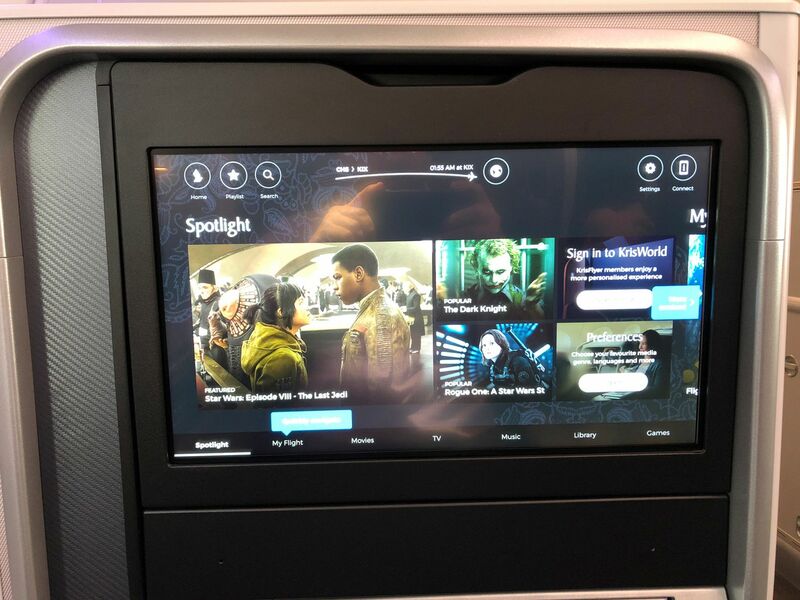 Inflight entertainment gets a solid upgrade from the 18 inch HD touchscreen monitor, which is as large any SQ business class screen. 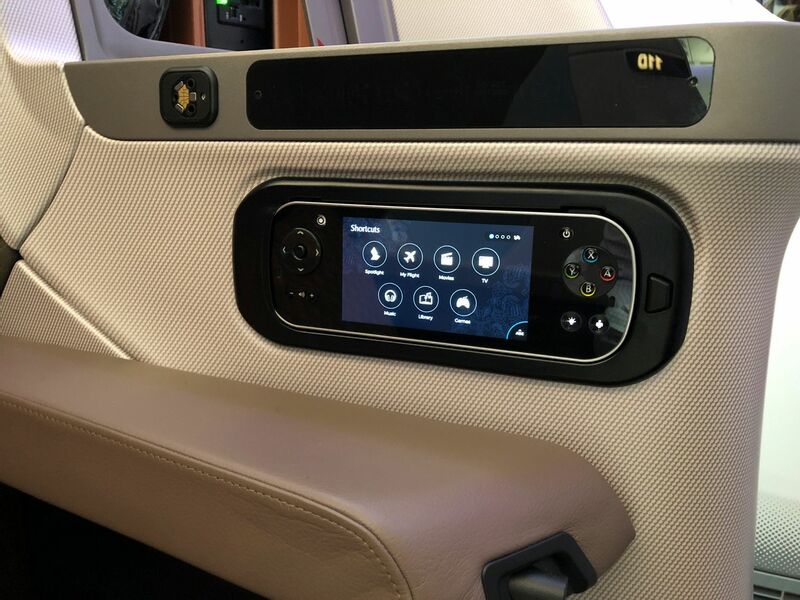 This is paired with a touchscreen handset controller docked in a recess next to the seat. The monitor can be titled downward for a better viewing angle if you’re lying in bed. 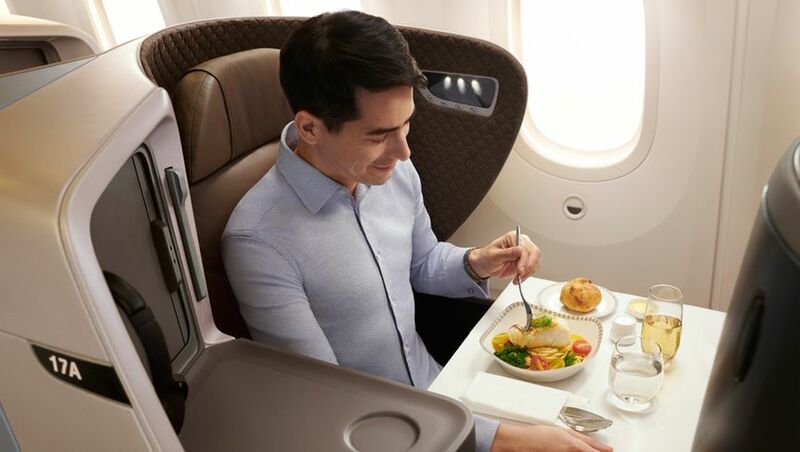 If you decide to get working above the clouds, Singapore Airlines’s new regional business class seat ticks all the technical boxes. 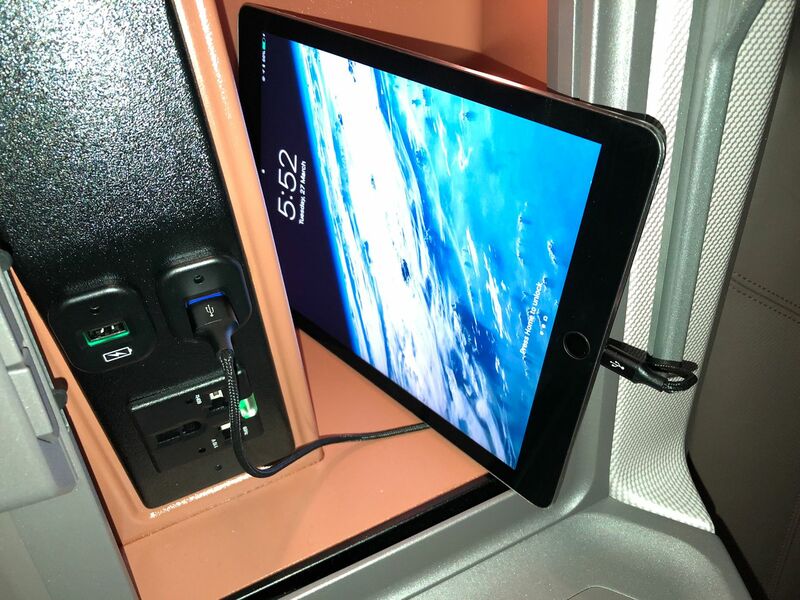 … and behind this, a sliding panel reveals a universal AC socket and two high-power USB ports to fast-charge your tablet or large-screen smartphone. We tested the AC socket with the large power brickette of a 15 inch MacBook Pro and found this fitted without drama. 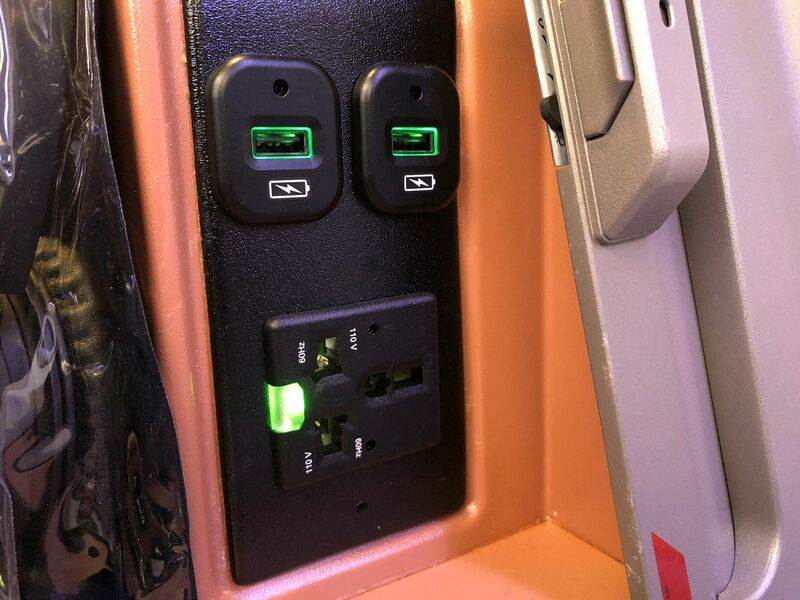 A recess next to this power panel contains a pair of noise-cancelling headphones, but you can always toss these into the overhead bin to free up some space for your tablet, phone or ebook reader while it’s charging – or just slide in your amenity kit, reading glasses and what-not. There’s also a concealed mirror fitted into the passenger-facing side of the shelf. … and it’s solidly mounted so there’s minimal bounce while you hammer away at the keyboard. 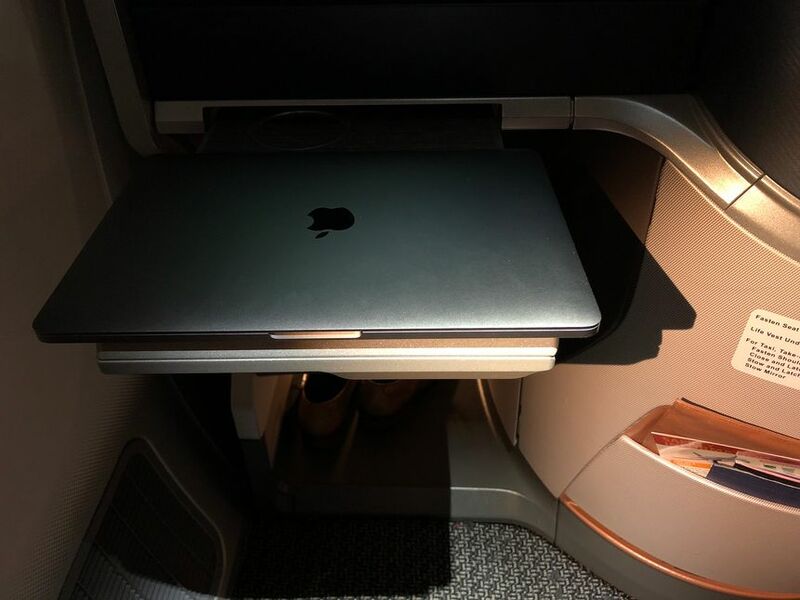 You can also fold the table back into half and slide it most of the way back in, then perch you laptop on top of it, to make it easy to leave your seat without having to disconnect everything and pack it all away. However, the curved literature pocket won’t be the ideal place to stow your laptop. 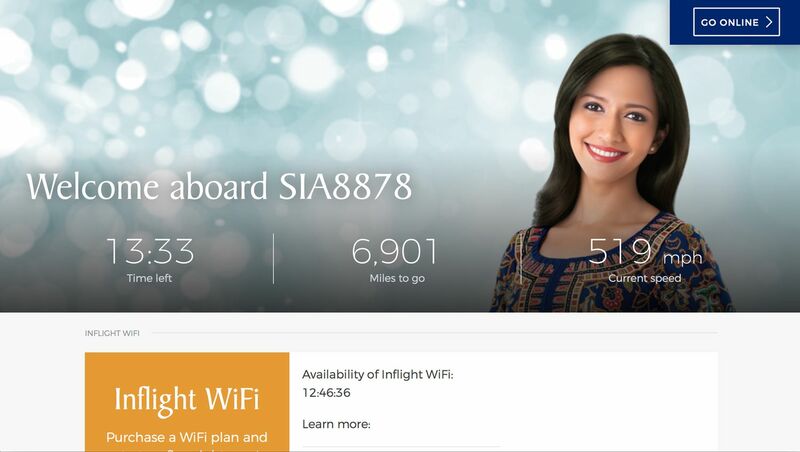 Inflight WiFi is available on Singapore Airlines’ Boeing 787-10 jets with 100MB free for first class, and 30MB free for business class and PPS Club members. Running along the inner edge of the console is a touch-sensitive control strip. … which emblazons your wish for solitude next to your seat number facing the aisle. Each button press on this control strip is accompanied by a short burst of haptic feedback similar to the gentle vibration of a smartphone’s alert. 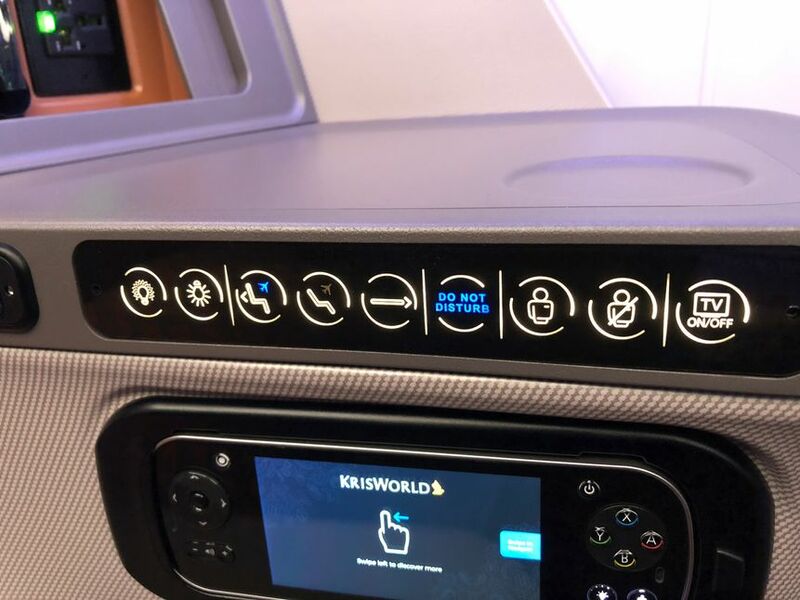 While we’re talking about lights, the inner shell of Singapore Airlines’ new regional business class seat boasts a second lighting panel. 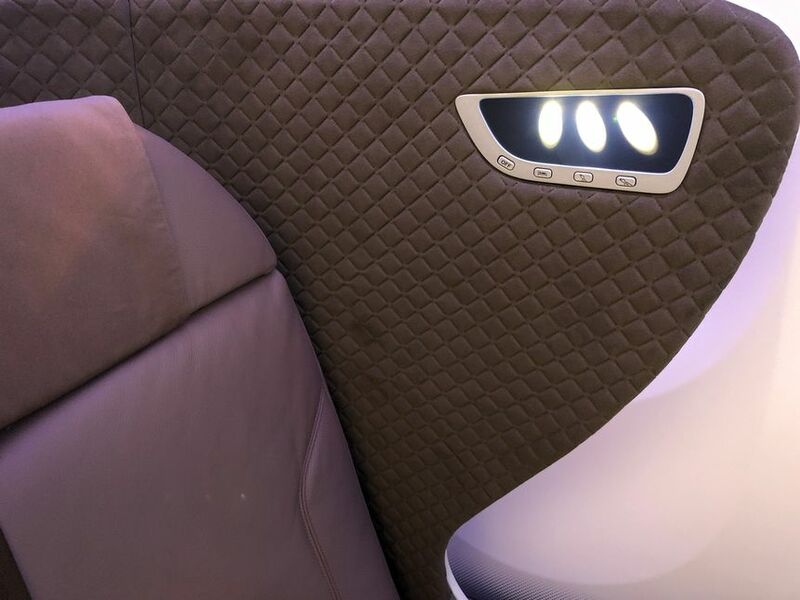 This has three LED spot beams angled to illuminate different parts of the seat: one goes almost straight down for when you’re in bed, a second casts down towards your lap where you might be reading a book, and a third shines more towards the tray table. Each light has three brightness settings, which you cycle through with each tap of the relevant lighting key. A single OFF button immediately extinguishes all three lamps. 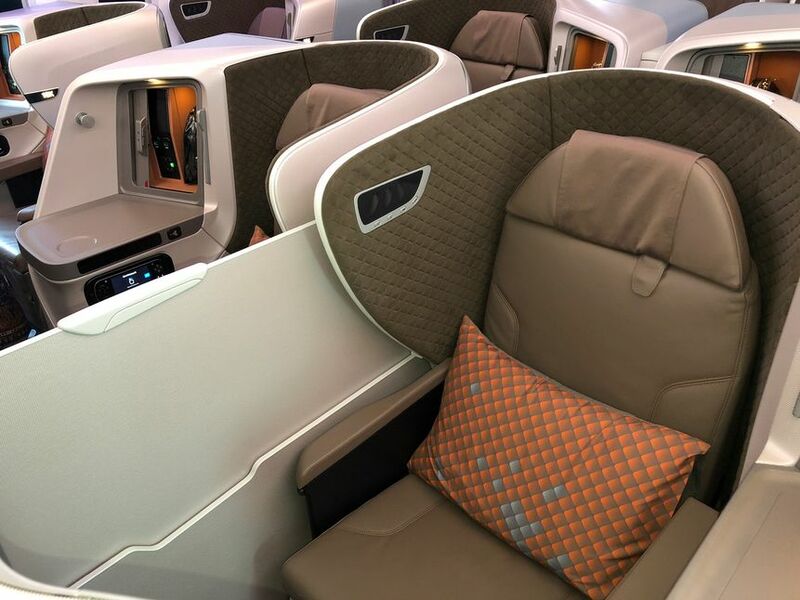 The overall style and colour scheme of Singapore Airlines’ new regional business class seats creates a family connection with the airline’s latest Airbus A380 and A350 business class. The seats are finished in aubergine leather with subtle copper stitching while the pillow contains elements of orange-copper and blue, both of which are drawn from Singapore Airlines’ colour palette. The cocktail table is clad in a textured satin powder finish while the sliding door opens to reveal a burst of burnished copper. Gentle patterns weave their way across the seat shell’s various panels in a dusky grey-blue, caramel, blue and bronze with a touch of subtle metallic dusting on some surfaces. The overall effect gives the 787-10’s business class cabin a premium feel of understated elegance, of high-end without the high-gloss. 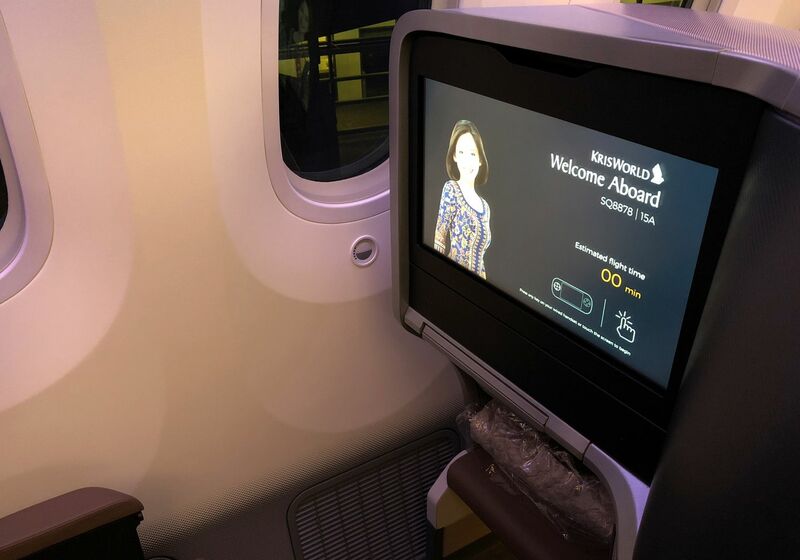 Anybody who’s flown in Singapore Airlines’ older regional business class will jump at the chance to fly this new Boeing 787-10 and Airbus A350 seat. And with Singapore Airlines planning a rapid ramp-up of the new jets, there should be plenty of chances. 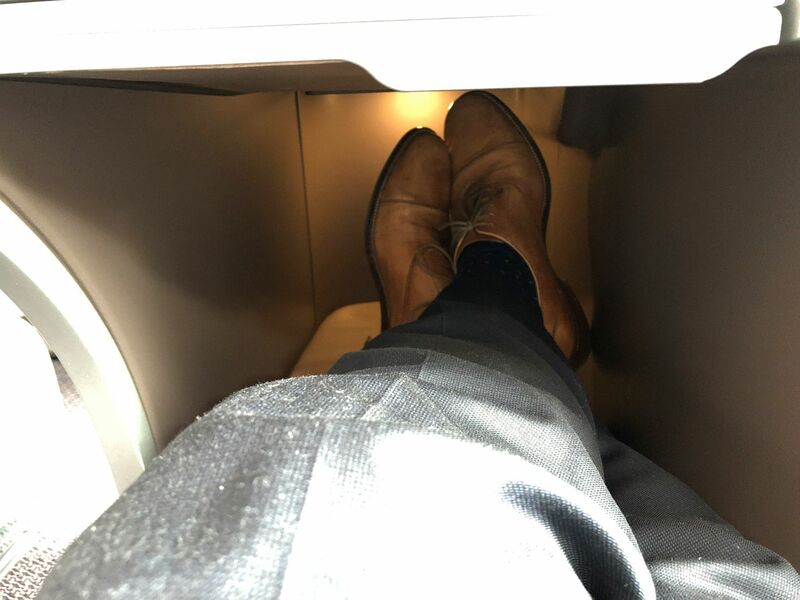 While I felt that the seat was too narrow for too long a stretch of travel, that has to be taken in the context of this being a regional business class seat. It’s intended for routes as short as 45 minutes through to an average of 3-4 hours and all the way to eight-hour journeys to and from Australia, which are often overnights. That’s a broad brief for a single seat, and I expect most Singapore Airlines customers will be very happy to see this seat on their next regional flight. 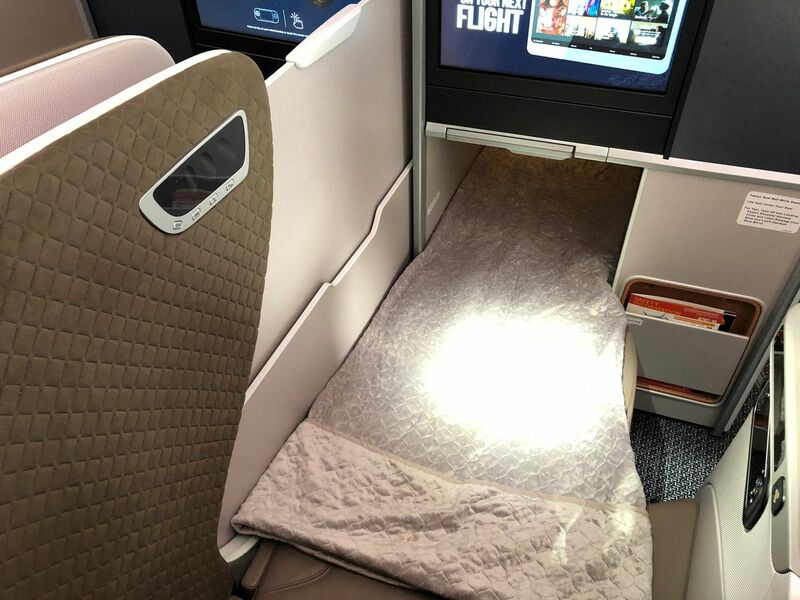 Seat looks good and it's great to see that SQ have opted for the straight sleeping position and no longer need to sleep on a twisted angle. 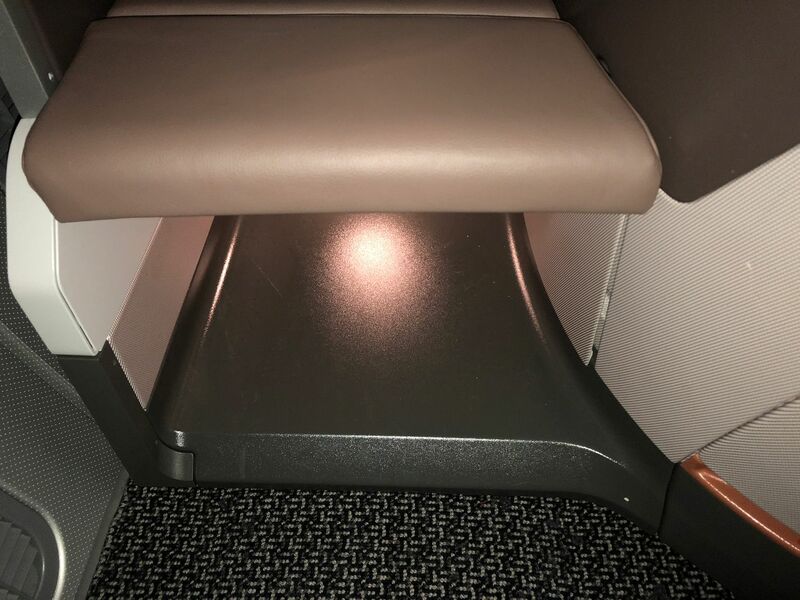 The narrowness of the seat is a slight concern, but as David has pointed out this seat is tailored for regional routes so it should be bearable for journeys up to 8 hours. As a regional seat it looks fine though obviously not quite as good as VA's The Business which also operates as a regional J class seat. 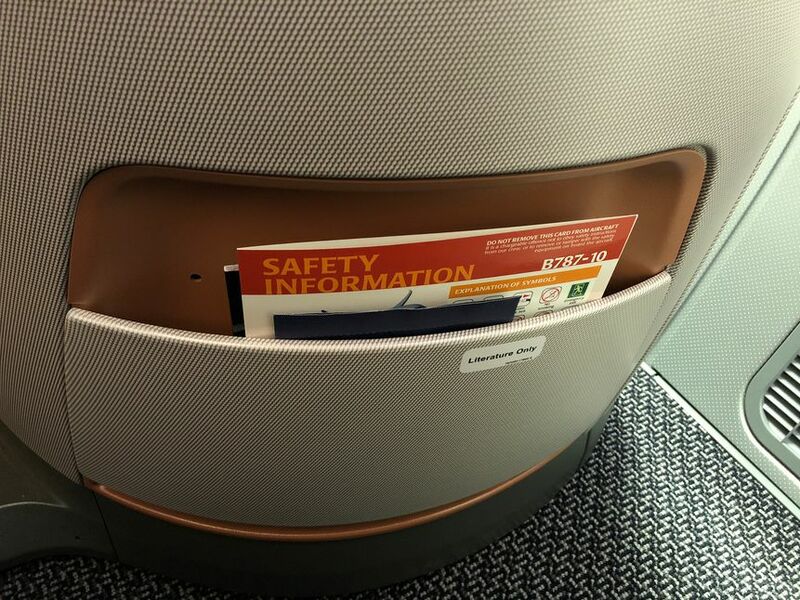 I wonder what the benefit of this seat is when fitted to an A350 however. 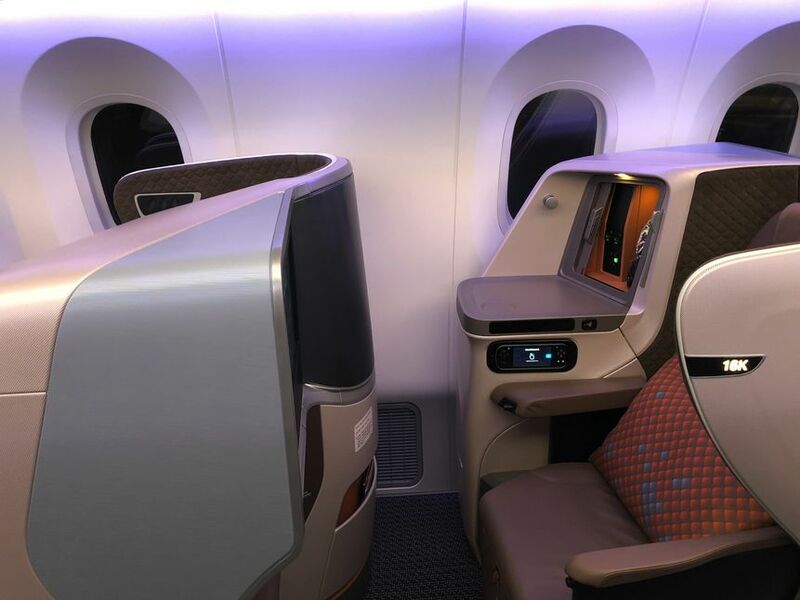 The 787 is not wide enough for the A350's J class seat but I can't see that they'll be able to fit anymore of these seats in an A350 compared with the existing seat (these seats are narrower not any shorter) so I wonder why you'd bother. 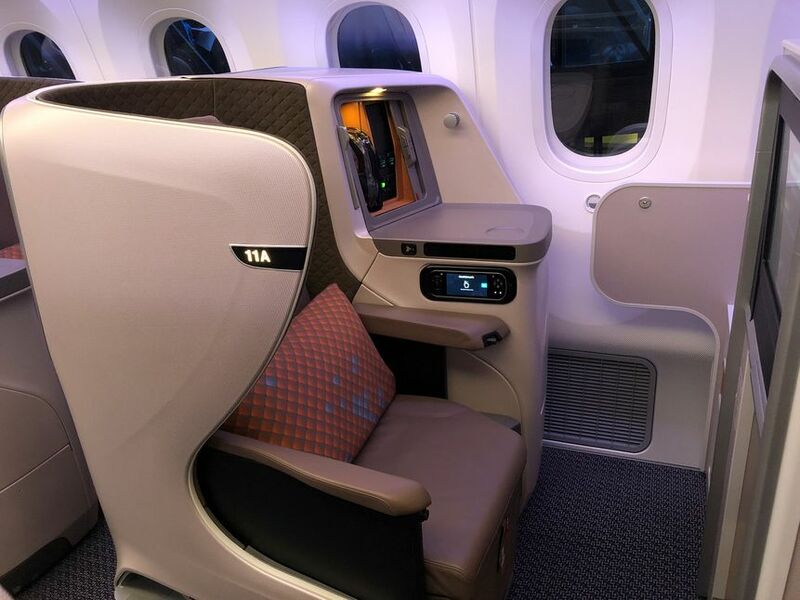 Stelia tell me they will fit the exact same seat with same dimensions onto the regional A350s, not ones with a slightly wider seat, so the net effect will be wider aisles – which the cabin crew will welcome, as a few commented that the aisles on the Boeing 787-10 were narrower than they're used to, and I did notice the galley carts and meal service carts were a bit of a tight fit. Looks fantastic. Can't wait to get into its when I fly KIX to SIN in mid May. The current A330/777-300 business seat is not particularly wide once you are lying down either, due to the angle. This actually looks wider, to be honest. If I had to spend 8 hour sitting I'd take the other seat, ironically, but if I wanted a sleep I'd prefer this one. 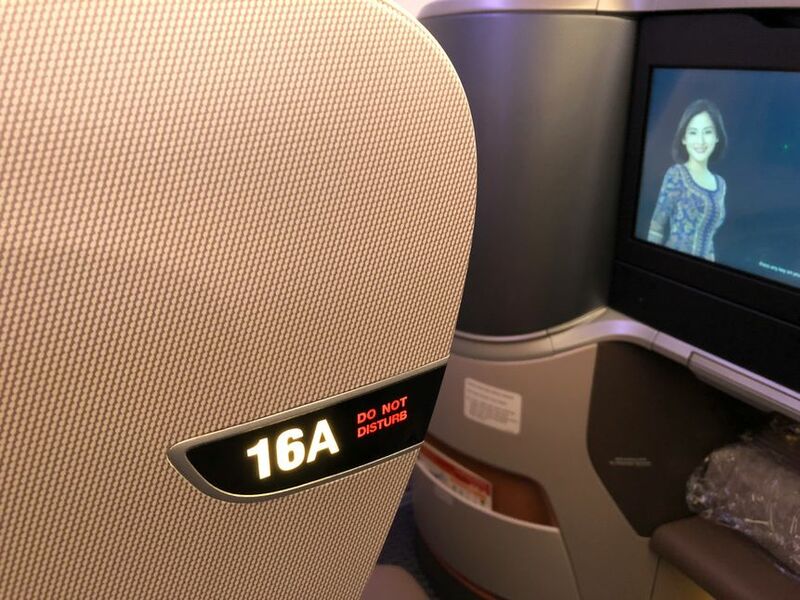 Sure you don’t mean the current A350/777 (long haul) seat? They you sleep at an angle which makes them effectively smaller. 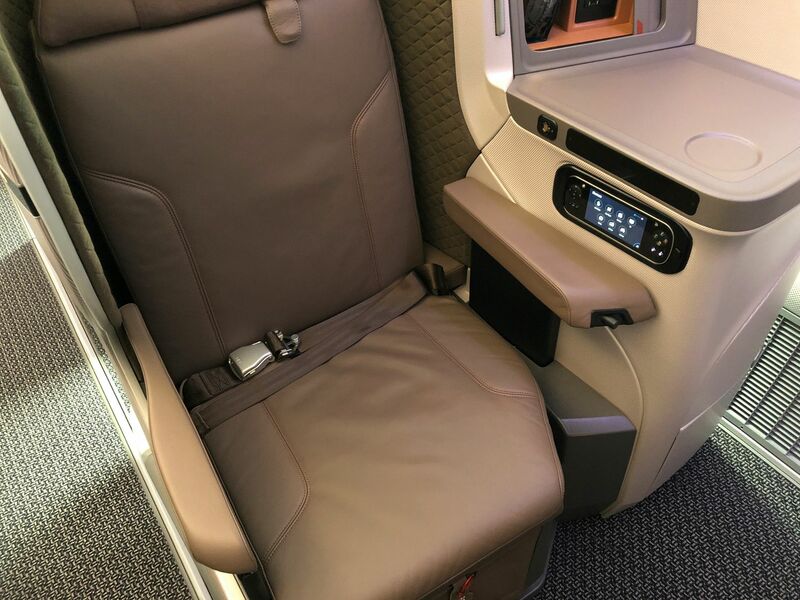 The seats fitted to the A330 and regional 777 Are the same width top to bottom. And before someone jumps in to correct me without reading properly I know the A330 seat is narrower than the 777 seat. 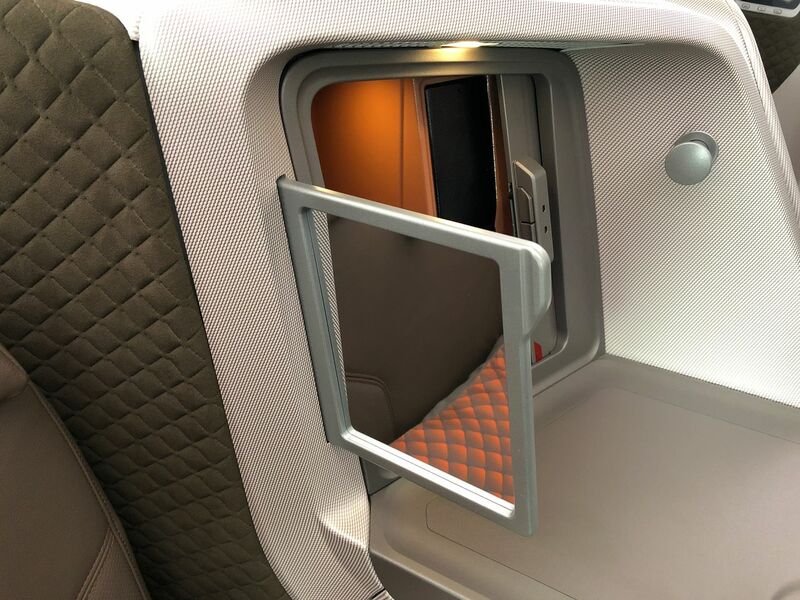 Why oh why have they designed a seat with a shell that blocks part of the window? 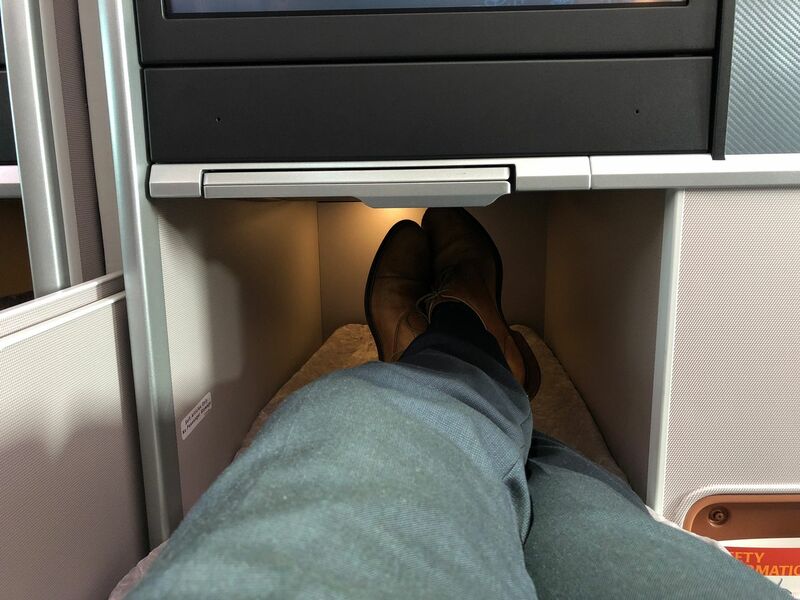 same problem with their new A380 seats as well. 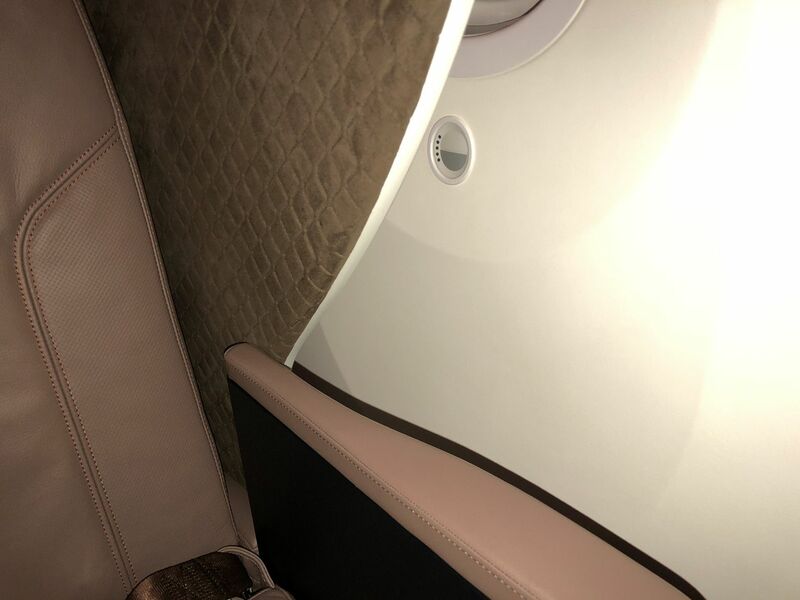 Yes, defeats the purpose of having larger windows on the B787 if they block it with a seat design. Oh my oh, the triangular shell case! That’s also the first detail I’ve noticed. David, you mention that the old 2-2-2 layout is gone, however I have booked a flight SQ248 MEL-SIN. Which seems as though its got the 2-2-2 layout (same as the A330 pictured above), my flight however is a B777-200er. Are you saying all A330's have been converted to 1-2-1, and the 777200er remains? "Gone" in a metaphorical sense in keeping with the intro, not "gone" as is "SQ has scrapped them all overnight". No conversions. 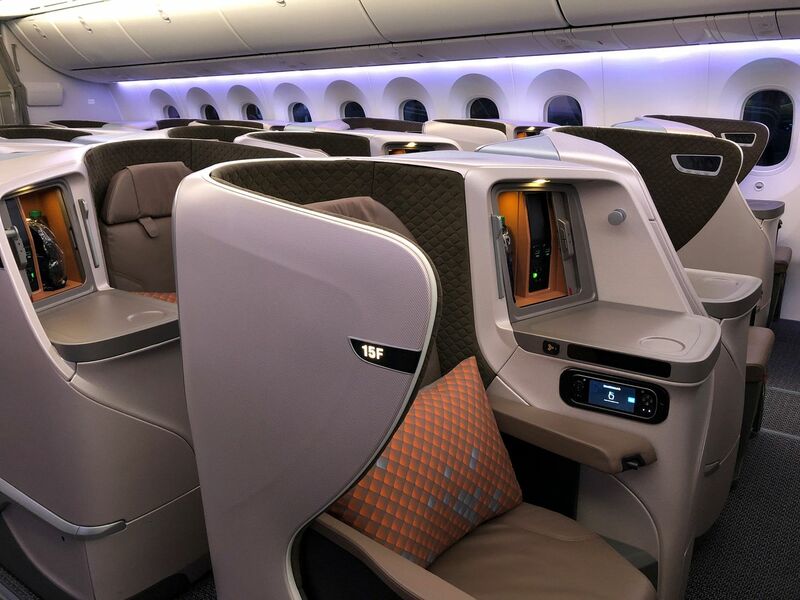 The Boeing 787-10s and later the regional Airbus A350s will replace the older jets with older seats – see https://www.ausbt.com.au/singapore-airlines-ramps-up-regional-fleet-with-boeing-787-airbus-350 for more on this. 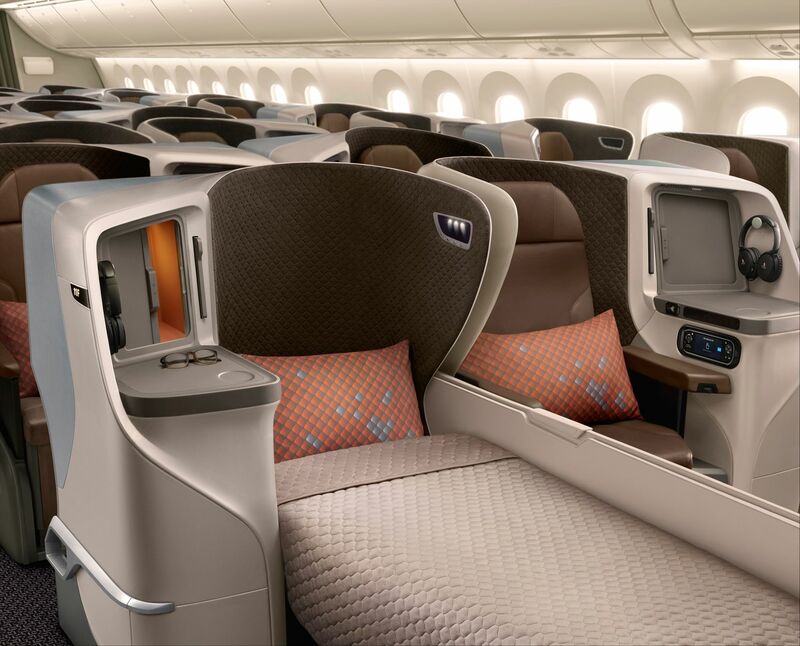 This looks much better than even the current 77W and A380 seats which are actually dreadful in the sleeping position. Not sure how any thinks sleeping on concrete at a 45 degree angle with your foot stuck in a cubby hole for the size of a child’s foot is comfortable. Recently having flown SQ Aus to China after not having flown them in many years left me dissapointed. Food is very average, and that’s even with book the cook. 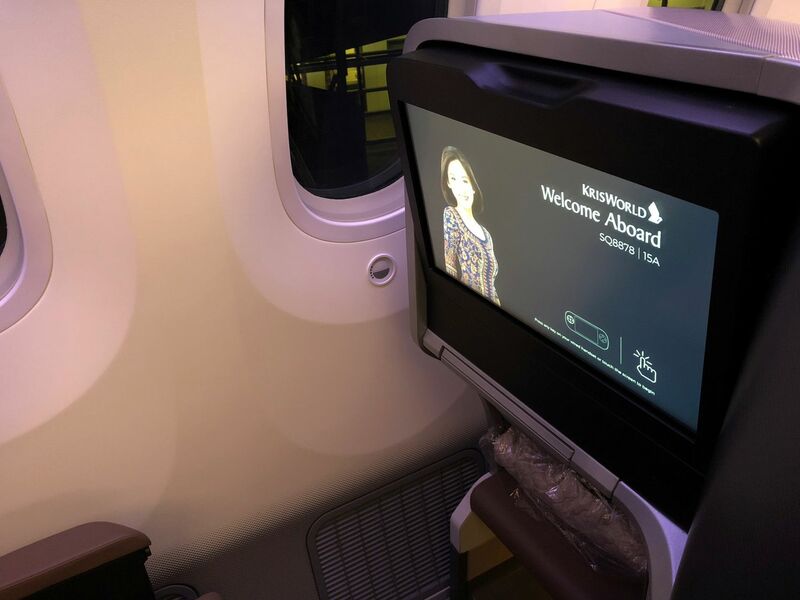 The only real highlights were the cabin crew and lounge in Singapore other than that I would find it hard to justify paying extra to fly them anywhere. There are plenty of better and cheaper alternatives. I think you are over rating the SQ lounge in Singapore. IMO that is pretty ordinary too! To me SQ has always been overrated. To me what they do well is consistency, which isn’t always good. Thank you for the thorough review. It looks like an excellent product for the stage lengths it will operate on. 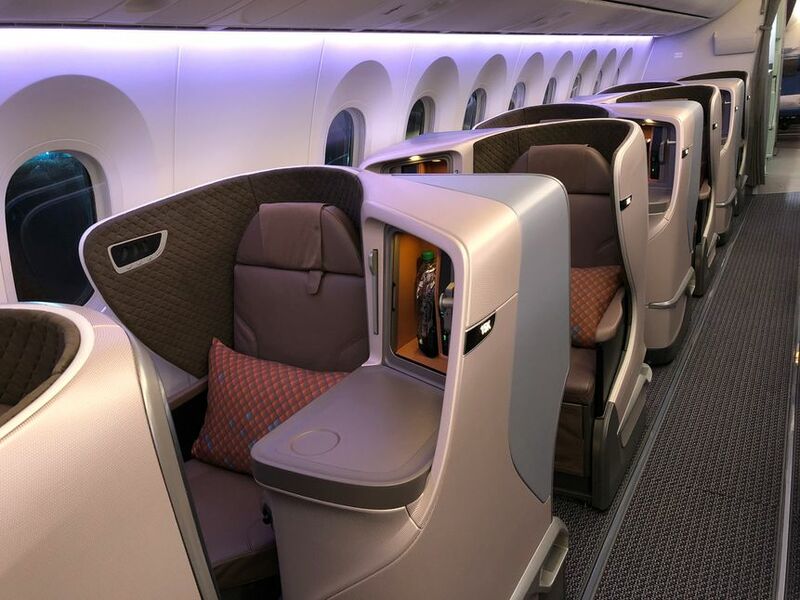 I think I prefer this more muted colour palette to the new A380 business class. 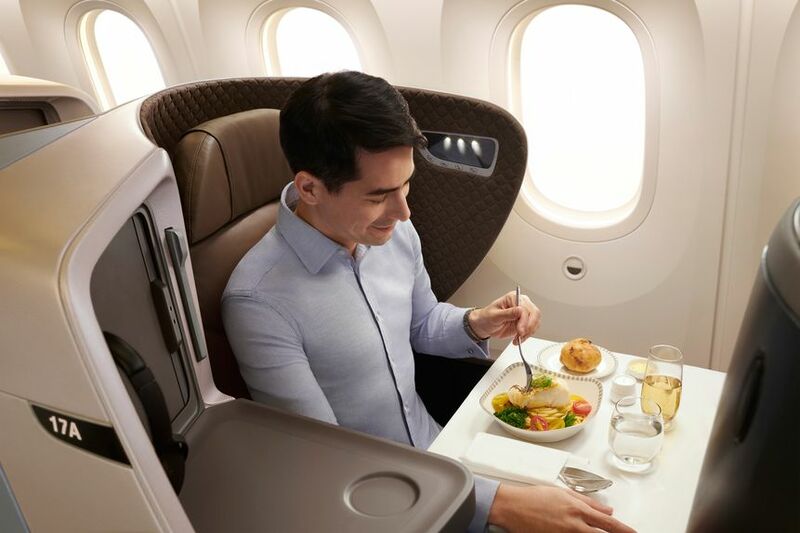 I love these thorough reports, nobody does them like AusBT and nobody else would take a 'free' trip and still be willing to make critical observations on the seat, in this case how narrow it is, although I can see where SQ is coming from because on most of its regional routes that will not be an issue. Well done AusBT and SQ! 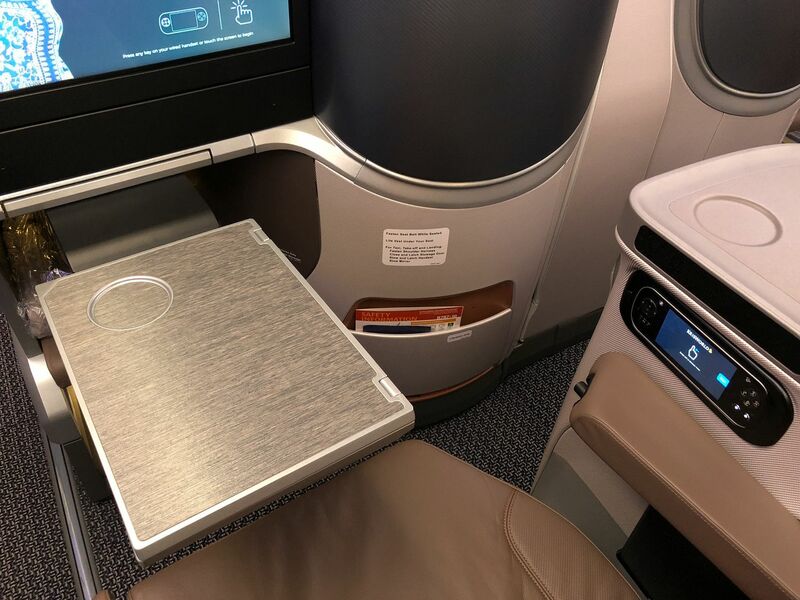 IF that is true, I had no problem in those seats, which are also used on DL, AA 767's and other carriers, so lets not single out only EK. ALTHOUGH, I did feel the seat was not as wide on the 767s. 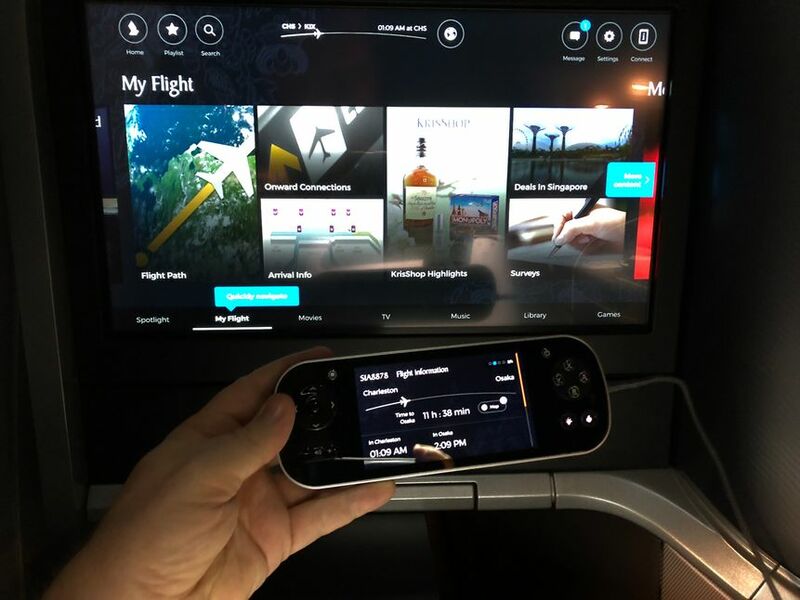 Neither DL or AA fly that product to Australia, whilst EK fly the A380 3 to 4 x daily to MEL, SYD. will be on this plane on 12th April. Would love to try 11a/k! This should have been their seat on the A380. And the width problem is solved by the A350 anyway as it is considerably wider than the 787. Using this as a regional business class when it looks better than their longhaul is just annoying. Nice looking seats and we'll designed (despite the width comments). Thank you for the thorough review. Overall, it looks great. It also looks like they have individual air vents which would be fantastic if that is what they are. 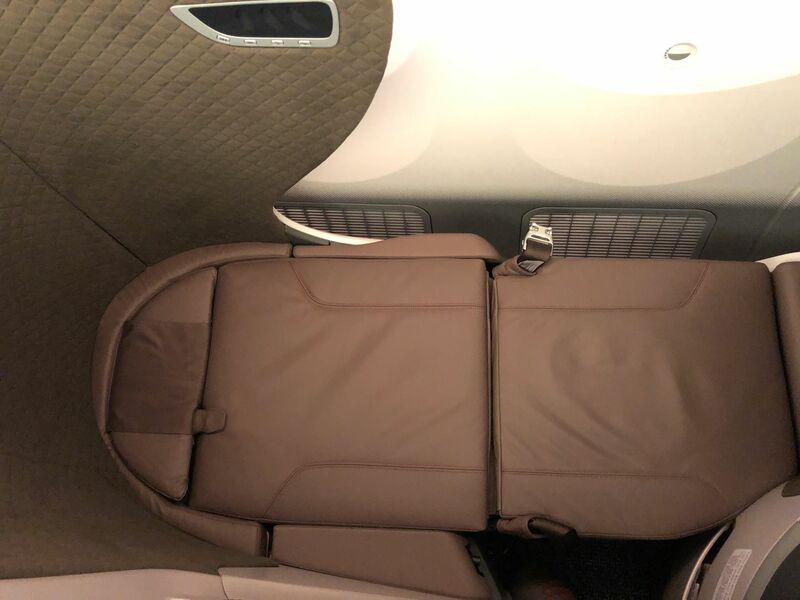 SQ don't let you pre-select the bassinet seats. They hold them in case people turn up on the day requiring bassinet seats who never requested one at the time of booking. I really think this shell concept will date. The whole privacy aspect seems over-rated to me. It's not that private, but you compromise a lot of important things in trying to achieve it. I would prefer an unimpeded view out a now larger window, I'd rather have a larger space for my feet, and I don't need so much shelf space. A good generous sized seat that is super comfy to sleep on, good lighting and storage space, and great service make the key ingredients. 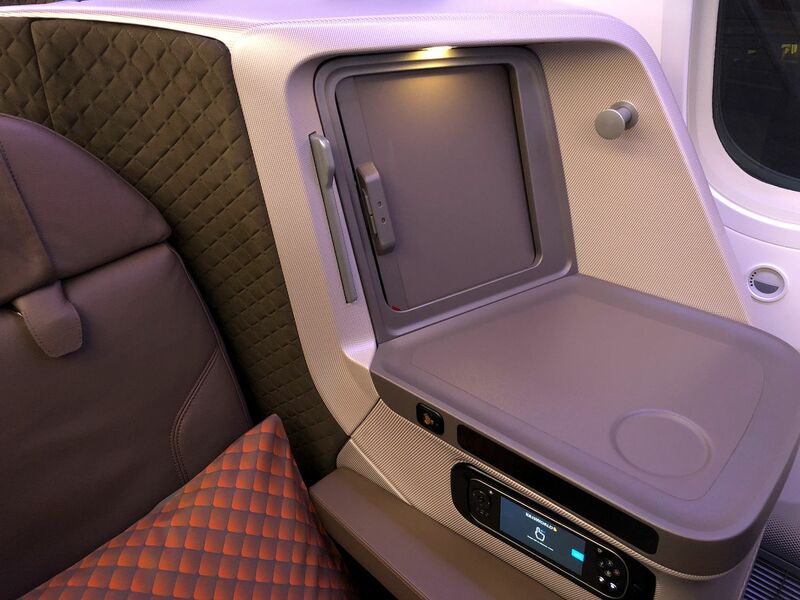 This SQ seat like many others is a stylish box aimed at cutting you off from all else. Think I'd prefer a more open design. But then I once sat near Cindy Crawford on a flight to LA and I would say that. Thank you for your excellent and informative review David. SQ seems to have hit the right note again with this new product. The colour palette is fresh and modern. I think this will be a very popular choice with the airline's customers. 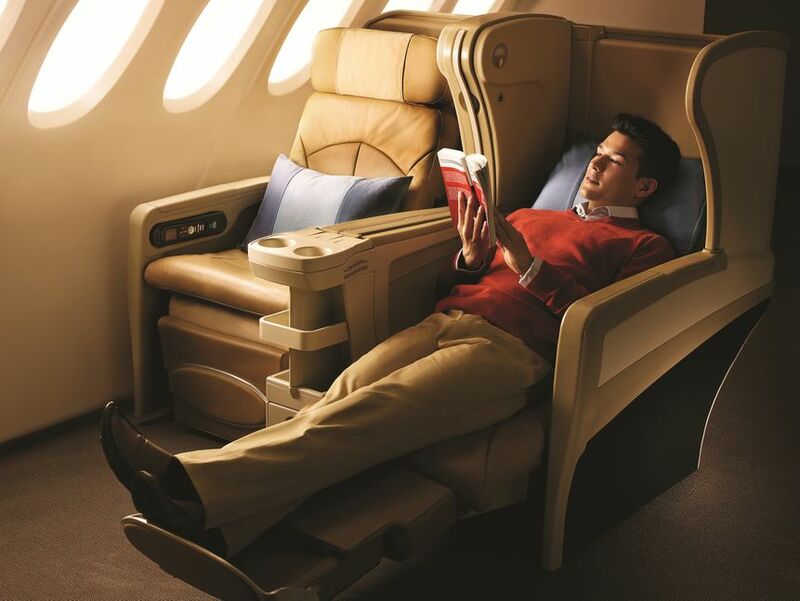 I surprised that Singapore Airlines don't put a mattress on top of seat when laying flat. I didn't find their seats comfortable at all. My favourite business seat ever remains the original A380 SQ seat, which was also on 777. They were great! My sentiments exact! 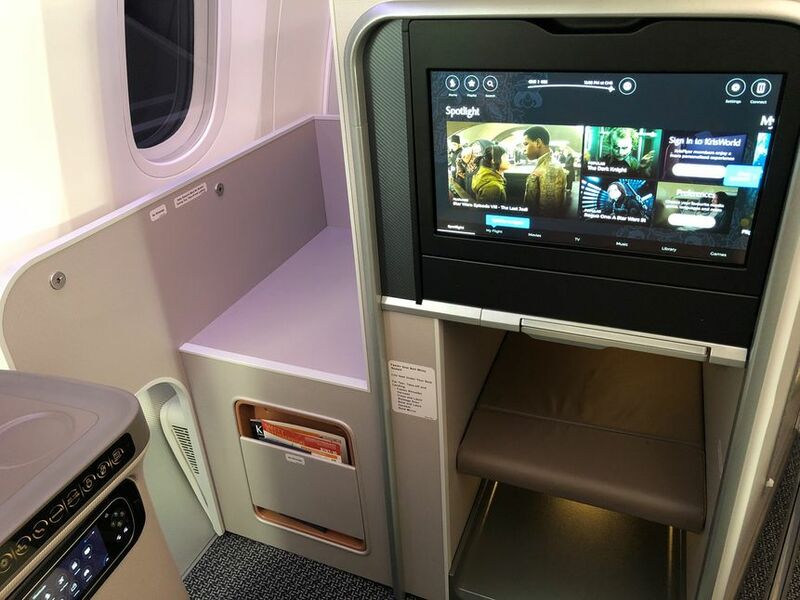 The 2007 Business Class was the first 1-2-1 layout for any major airline and it stilll looks impressive today. A massive seat you simply pull down fot an actual mattress.. Elegant and simple. 100% agree with the above! David, a great review with amazingly detailed photos. Similarly to others, I don't want a window blocked. 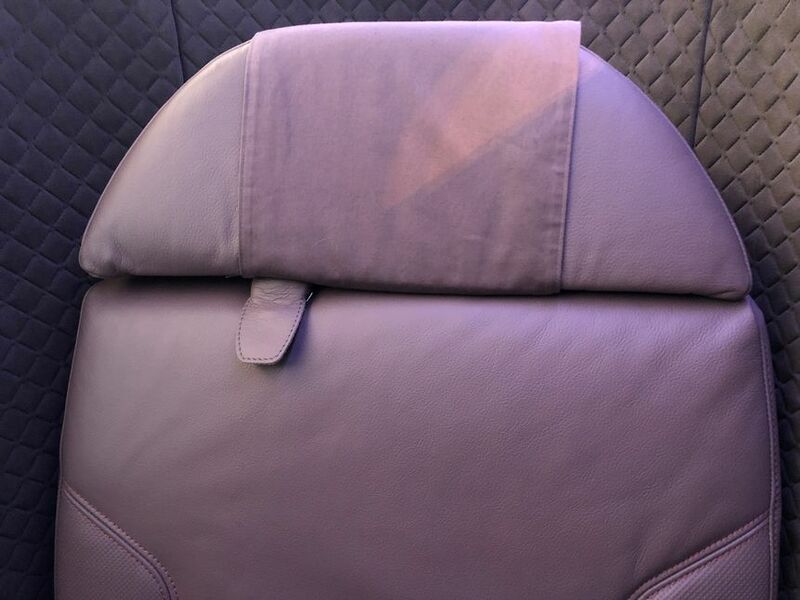 You've described the seat colours and we can see it, but what is the material the airline used? Leather. Good point, I'll add that in. Any visibility of the Economy cabin? 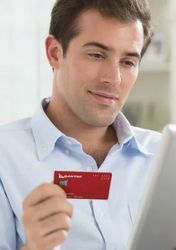 No, as we tend not to cover economy on Australian Business Traveller, but plenty of other websites have covered it so a quick bit of Googling will work for you. Surely "regional" will define 80% of their routes. So this set up will the vast %Of their fleet. Comment on "Review: Singapore Airlines Boeing 787-10 regional business class"